M Mushfiqul Fazal from Hamburg, July 8 (Just News): The Group of 20 summit has ended without a consensus on the key issues of climate change and trade. 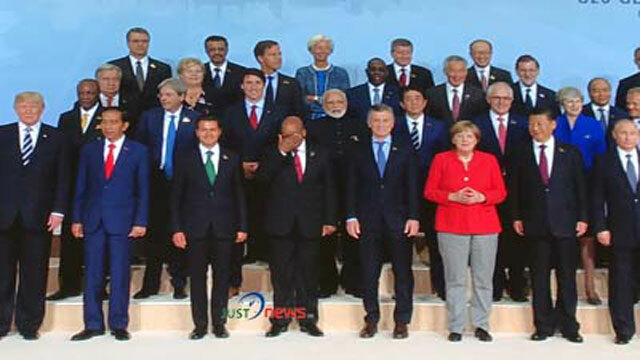 While the leaders agreed on many topics discussed during the meeting, the final wording of the communique reflected a 19-1 split on trade and climate change. On trade, the communique said the G20 backed free trade and pledged to “continue to fight protectionism”. But in a concession to the U.S., it also said members recognized “the role of legitimate trade defence instruments”. That’s a clear reference to Mr. Trump’s ‘America First’ agenda and his vow to slap on steep tariffs on imports that he believes are unfair to U.S. companies. If the meetings within the tightly secured G20 summit venue were anything but harmonious, outside chaos and violence gripped Germany's second city. Ten minutes' walk from the summit venue, charred road barricades, trashed shops, debris and shattered glass bore testimony to an anarchic Friday night of street clashes between protesters and police, when commandos chased protesters who hurled rocks from rooftops. On Saturday, thousands of anti-riot cops were again on guard, as helicopters hovered overhead, with at least 20,000 demonstrators on the march again. G20 leaders, including Canadian Prime Minister Justin Trudeau, are particularly concerned about a trade war brewing over steel and indications the U.S. will impose tariffs on steel to counter allegations of dumping by China. On climate change, 19 leaders agreed that the Paris Agreement on climate change was “irreversible” and they pledged to fulfill the commitments made as part of that accord to reduce greenhouse gas emissions. The summit’s host, German Chancellor Angela Merkel, labelled the meeting satisfactory, but she acknowledged the failure of the leaders to come to a common position on the big matters and said she “deplored” the U.S. decision to pull out of the Paris accord. Mr. Trudeau tried to put a brave face on the disagreements, saying that it was a “big success” that 19 countries stuck together on climate change and trade. Former Canadian diplomat Tom Bernes said the summit accomplished little but also didn’t fail, as many expected. “There was no great forward progress but there was no retreat, which was the big risk,” he said labelling the meeting “indifferent”. Russian President Vladimir Putin says he thinks President Trump believed his in-person denials of Russian meddling in the U.S. presidential election. Putin spoke Saturday after the Group of 20 summit, where he and Trump had their first face-to-face meeting. He said Trump asked him numerous questions about Russia's alleged interference in the U.S. election during a lengthy discussion on the issue. Putin says he thinks his answers satisfied Trump, but added that Trump's opinion would be better sought from the U.S. president himself.